A few weeks back, I posted a quick set of tutorials on quilling paper greenery and leaves. That post was the first in a series on quilled greens that you could use to dress up your own paper flower designs. 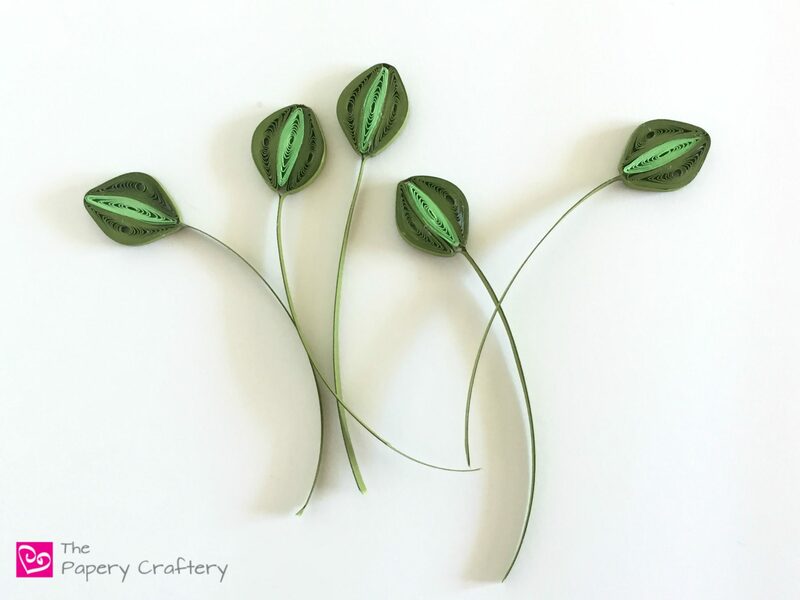 This week, I’m sharing 5 more types of quilling paper greenery. Each one is a tiny bit more complicated than last time, but still totally doable for a beginner! As opposed to last time, all of these leaves are formed from more than one shaped coil. But, they’re still fairly simple to make. To start, the most basic leaf is made from two half circles, with one end pinched more than the other. I used 22″ strips to make an inch long leaf. Glue the half circles on either side of a stem, and squeeze tightly. The result will be a long leaf that is tapered on one side. TIP: Make quick paper stems by gluing 2-4 strips of the same length on top of each other. The more strips, the sturdier the stem will be. Once you’ve got the long leaf down, try making a few extra leaves of the same size and adding them to the stem. You’ll create wide palm leaves that can be left flat, or stacked on top of each other to add some height and dimension to your floral designs. Similar to the long leaf is the heart-shaped leaf. To make one, roll long strips of the green of your choice. Pinch the coils into teardrop shapes, and add to a stem. Tuck heart-shaped leaves into paper lilac or morning glory bouquets! They make beautiful ivy, too. Now, let’s step it up a bit! Choose two coordinating green colors. With one, roll an 11″ strip and shape into a marquise. With the other color, roll two coils from 17″ strips, and pinch them into half-moons. Glue all three shapes together, and hold or pin until dry. Fold a strip of quilling paper that is the same shade as the 2 outer half-moon shapes. This is going to be used as both the stem and the finishing piece to the leaf. Run a thin line of glue along the outer edge. Tuck one end of the two-color leaf into the fold of the last strip and wrap it all the way around the leaf. Glue the rest of the strip together to form a long stem. These mini leaves look great in clusters! To make broad, thick leaves, try building them from 5 coils. This time, all the strips can be the same length (I used 17″ strips for an inch-long leaf). One strip will be rolled into a coil and shaped into a marquise. The other 4 will be rolled and shaped into half-moons. Once all the shapes are made, glue them into one leaf in the same way as in the photos below. After the broad leaf dries, wrap the outside a few times with another strip of quilling paper to make a polished, finished look. Try making these in groups of three. They even look sweet in a much smaller size. The examples I’m sharing of 5 more types of quilling paper greenery are just the beginning! I have a couple more posts in the works with even more ideas to add leaves and greens to your quillings. In the meantime, you can use the same techniques to recreate all the leaves you see outside. Let me know what leaves you’re working on in the comments below and, as always, happy crafting! Lovely leaves! Thanks for sharing. Thank you, I hope they’re useful to you!